Transport for London (TfL)’s new Operations, Maintenance and Control (OMC) depot for the Elizabeth line at Old Oak Common, West London is a state-of-the-art, nine-track train maintenance building. It is part of the £142 million contract awarded to Taylor Woodrow and will accommodate 33 trains while routine maintenance is carried out. While it is fairly obvious that each of those nine roads would need to be closed off by a door, selecting the correct type was not as straightforward as may be thought. 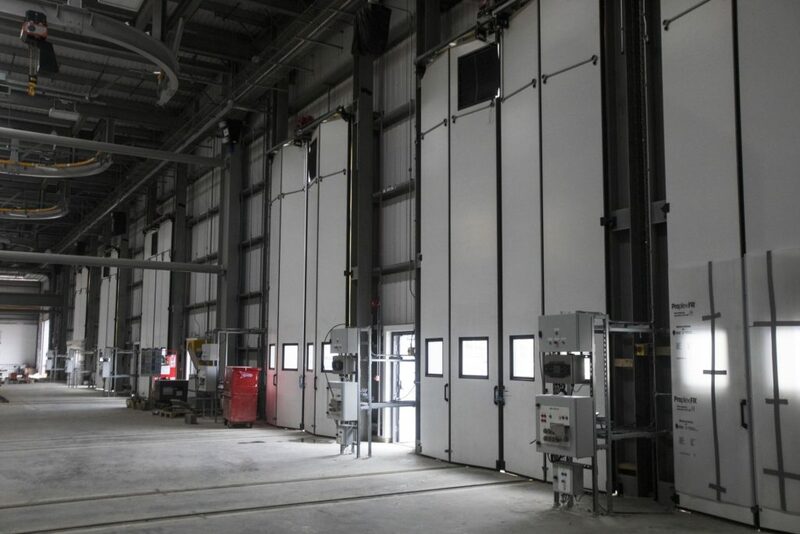 Specialist industrial door manufacturer Jewers Doors was therefore contracted to supply and install eight of its latest Swift-SEW and two smaller Swift horizontal bi-folding doors for this application. Four metres wide and 6.6 metres high, each of the main doors is made up of four highly insulated, single-piece composite panels, with two leaves folding to each side when open. An 850mm x 760mm cut-out allows an OLE cable to pass through the closed door. The cut-out is lined with 9mm thick safety matting tested to 30kVA to prevent bird entry and, for additional safety, the door is earthed back to the structure with suitably rated earth bonding braids. Elizabeth line OMC roadway doors. For visibility when closed, each door panel incorporates a 600 x 600mm argon-filled, double-glazed vision panel made from toughened glass, fitted with multi-wall rubber seals to all edges to reduce water, air and dust ingress. To meet the environmental criteria, panels are injected with CFC-free polyurethane foam providing a thermal efficiency U-value of 1.1W/m2/°C and noise reduction of 25dB. To eliminate the spread of fire and to provide great rigidity and strength, panels incorporate an internal steel frame to all edges. The doors are operated by a powerful, centrally mounted drive unit, supplied by SEW-Eurodrive, combined with a purpose-designed control panel incorporating inverter control for smooth starts and stops. The system takes less than eight seconds to full open and close, and safety is ensured with full height, pressure-sensitive safety edges and photocell beams to create a safe zone around the door during operation. In addition to the drive unit holding the door in the closed position, a pair of automatic solenoid-operated floor bolts provides additional security and prevents wind-damage. In the event of power failure, a low-level disengage handle enables the doors to be opened quickly by hand from ground level.